Only two more days of work before a week of vacation. All of my schools managed to make it through the last day before winter vacation without major incident. YEAH!! Now just two lazy days in the office doing paperwork and then I get to take my break. After spending the weekend with my parents, I have 8 days just for me. I already have my list of chores and stitching that I would like to get done. For my stitching over break, I hope to finish my garden exchange, get a good start on my wedding sampler for my sister and spend most of Wednesday working on Celtic Winter. I am also going to work on setting up a new rotation and getting Butterfly at Rest and the wedding sampler in their spots in my WIP drawers. I was able to work for 2 hours on CW tonight and made good progress. Of course it is hard to tell in the picture though. 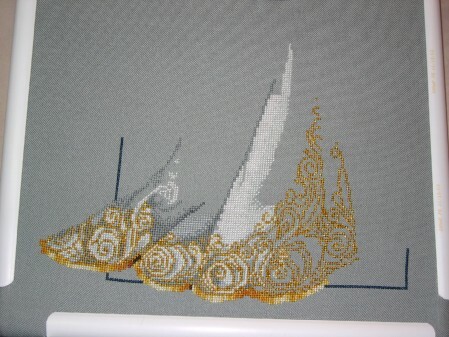 All those light blues get lost in the backgroup and the goldwork in the photograph. I am also one letter shy of finishing the current wedding sampler. Hooray!! I can finally post pics of it on Friday as it will be given to my friend shortly thereafter. CW looks great!!! I am looking forward to a week off too, with plenty of stitching (mixed in with errands, chores and responsibilities too – boo!!!) Have a great holiday! Hmm. I’m gonna have to make a trip out early next week to get fabric for Butterfly at Rest! I have everything else for it (including the 500 differnt colors of DMC?! Why does it have 2x the amount that the Mirabilia project does?!). CW looks great! I will not pick mine up again until after the holiday ….I missed stitching with ya’ll last night!